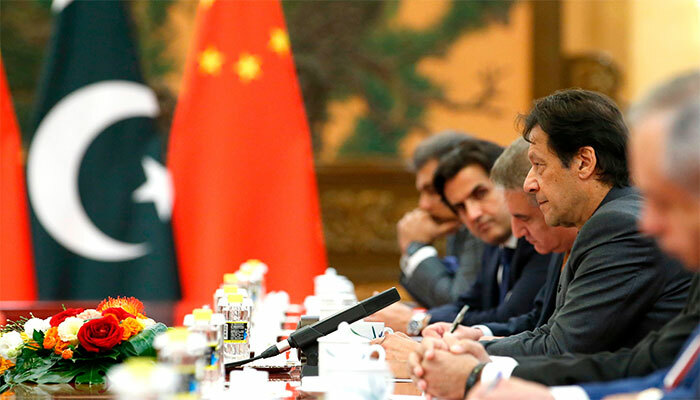 ISLAMABAD: Prime Minister Imran Khan Saturday encouraged the Chinese business leaders to explore investment opportunities in the diverse socio-economic sectors of Pakistan which offered immense market potential due to its geo-strategic advantage. The prime minister assured maximum facilitation to the Chinese business companies for doing business in Pakistan. He was talking to a number of heads of major Chinese business groups that called on him in Beijing, the PM Office media wing said in a press release. The executives included Chen Fenjian, Chairman China Railways Construction Corporation (CRCC), Chen Siqing, Chairman Bank of China Group (BOCG), Yan Zhiyong, Chairman POWER CHINA, Da Can Like, Chairman China Rainbow International Investment, Charles Yang, President Huawei Middle East Region and Lyu Zexiang President China Gezhouba. Foreign Minister Shah Mahmood Qureshi, Finance Minister Asad Umar, Railways Minister Sheikh Rashid Ahmed, Adviser to PM Abdul Razzak Dawood, Minister for Planning Makhdoom Khusro Bakhtiar, Minister for Maritime Ali Zaidi and Chief Minister Balochistan Jam Kamal Khan were present during the meeting. Foreign Secretary Tehmina Janjua, Ambassador Masood Khalid and other senior officials were also present. The business leaders congratulated the prime minster on victory in the elections and assuming his office. They said under the leadership of the Prime Minster Imran Khan, Pakistan would enter a new era of development and expressed their gratitude for the support Pakistan was extending to the Chinese companies in hydropower, renewable energy, construction, infrastructure development, ICT and other sectors particularly under the CPEC projects. The executives expressed their desire to further invest in Pakistan’s socio-economic sectors. Prime Minister Imran Khan appreciated the business ventures of the Chinese companies in Pakistan particularly under the CPEC projects and expressed his satisfaction over the progress on these projects. He also shared his socio-economic reform agenda with the Chinese business leaders. Muhammad Saleh Zaafir from Islamabad adds: Prime Minister Imran Khan has concluded his visit to Beijing and is reaching Shanghai on the last leg of his trip to time-tested friend of Pakistan. He will be guest of honour in an international Expo. According to wire report Chinese Vice Foreign Minister Kong Xuanyou maintained in Beijing after the meeting of two prime ministers on Saturday that China was willing to offer assistance to Pakistan to help it weather its current fiscal woes. The vice foreign minister reminded that the two sides had “made it clear in principle that the Chinese government will provide necessary support and assistance to Pakistan in tiding over the current economic difficulties. “As for the specific measures to be taken, the competent authorities of the two sides will have detailed discussions,” Kong said. Kong said there were no plans to scale back the China-Pakistan Economic Corridor (CPEC), although he did say it would be altered somewhat to “tilt in favour of areas relating to people's lives”. “There's been no change in the number of CPEC projects. If there were to be any change, it would be an increase going forward,” he said. The visit has taken place in the assessments that the two countries need each other’s support on the political challenges they face at present. China will expect Pakistan’s support on its maritime disputes in the South China Sea, on the One China Policy and Taiwan, and on the separatist threat from Uighur extremists in Xinjiang.